I've played a lot of online slots games (haha... understatement of the year!). 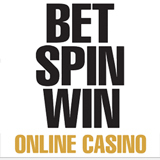 It takes a lot to impress me but I'm really impressed with the selection of games at the new BetSpinWin.com. Not only do they have all my favourite Microgaming slots, they also have a bunch of 3D slots from BetSoft that I haven't seen or played before. The top-of-the-range 3D slots and live casino offering complement BetSpinWin’s range of online casino games, while the casino prides itself on fast payments and promises that winners will not be penalised. And isn't that just what we want to hear? !